Two Persons coffee shop is located inside the Bok Building at 1901 S. 9th Street in South Philadelphia. 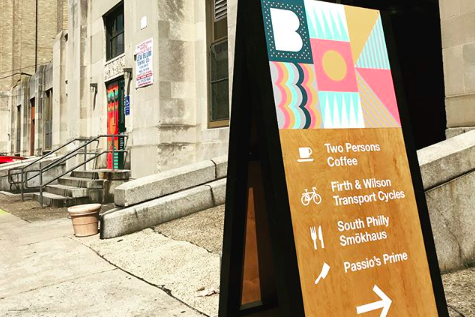 One of Philadelphia's most successful adaptive reuse projects is now home to a coffee shop celebrating its Pulitzer Prize-winning namesake. Two Persons opened its doors this week at South Philadelphia's Bok Building at 1901 S. 9th St. The former vocational school at the site was shut down by the School District of Philadelphia in 2013. Ever since, the property has been reclaimed by a variety of creative and arts-focused businesses well-situated to utilize the property's former classroom and lab space. Named after Edward Bok, the editor and author who once ran Ladies Home Journal in Philadelphia, the building's tenants now have access to java from Last Drop Coffeehouse founder Adam Gery. Architect Whitney Joslin teamed up with Gery to put together a coffee shop named after the book published by Bok in 1922. "Philadelphia has a vibrant and booming coffee culture, but we realized this particular part of South Philly was a bit of a coffee desert," said Gery. "From a practical standpoint, we wanted to serve the growing tenant population of Bok a great cup of coffee without having to walk 10 or 15 minutes in one direction." Two Persons' mission to serve locally sourced and prepared products includes coffee from Lancaster-based passenger coffee and pastries from Machine Shop Boulangerie, located on the fourth floor of the Bok Building. “We were magnetized to the creative challenge of turning an old tool shop into, what we hope, will be the new nucleus of Bok and the surrounding neighborhood,” said Joslin. Two Persons is accessible via a new public entrance at 821 Dudley St. Hours are Monday through Friday from 7 a.m. to 5 p.m. and weekend from 8 a.m. to 3 p.m.